Greater flexibility in processing phone orders and handling B2B payments with the Brightpearl Payments app. “The Brightpearl Payments app is extremely good. It streamlines taking payments over the phone, so whoever is taking the orders can just do it all in one screen; there’s no need to get the card machine out. It’s also more secure, and better for data protection." Brightpearl Payments supports your B2B payment workflows, allows you to send ‘click to pay’ invoices and save client payment data for future use. With Brightpearl, you can integrate your own payment accounts and assign them to different scenarios. Today we work with Authorize.net, Braintree, Sage Pay, PayPal, Worldpay, USAePay, Stripe, and iZettle, and we’re adding more all the time. 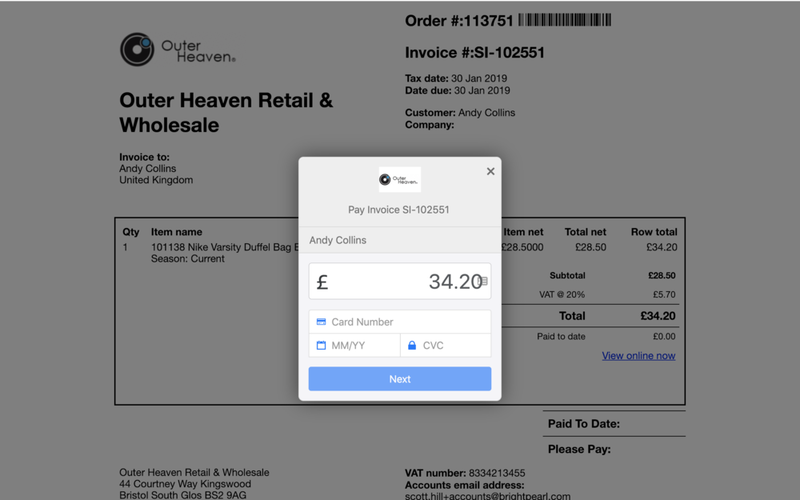 Process and refund phone order transactions through our virtual terminal, directly from Brightpearl’s order workflows, including deposits for B2B accounts. Process payments on account for your B2B accounts over the phone, automatically reducing their account balance and your accounts receivables. Any templates that you send from Brightpearl can be customized to include a link for the customer to pay without having to call, which in turn, will automatically update their order and account balance. Keep your clients’ card details on file for ease of service on their next order, with all details stored in the payment providers’ vaults to keep your PCI compliance in check. For each integrated gateway you can define who in your organization has the authority to take payments for orders, settle accounts, and process refunds, leaving you confident that only approved team members are processing transactions. We’ll automatically capture any payments you’ve authorized over the phone as your warehouse team ships the orders, removing the task and delay in getting your funds. Process card payments in store or on the road using Brightpearl point of sale, ensuring a seamless and professional consumer experience. Of course you can also take cash payments, and payments on account in person too. Use Brightpearl’s integrated payment gateways to process transactions faster, more securely, and directly within Brightpearl. Take payments over the phone for orders or on account, or generate invoices to send to your B2B clients. Aenean tempor varius mi id viverra. Sed cursus, neque a egestas aliquam, mi sem efficitur tellus, nec porta sapien ipsum vitae lectus. Quisque vel ante orci. Duis elementum risus ante, rutrum ullamcorper felis euismod id. Donec porttitor rutrum semper. Orci varius natoque penatibus et magnis dis parturient montes, nascetur ridiculus mus. Proin ac elit turpis. Duis elementum risus ante, rutrum ullamcorper felis euismod id. Donec porttitor rutrum semper. Orci varius natoque penatibus et magnis dis parturient montes, nascetur ridiculus mus. Proin ac elit turpis. Centralize all your payments in one system with a flexible payment gateway app that’s fully integrated with your other retail operations including inventory, sales, purchasing, CRM, POS and accounting. Can I use my existing payment providers? As long as we’ve integrated into them, yes. If you don’t see your current gateway of choice in the list above then get in touch - we’ve got a few in the works and are always happy to engage with new payment partners. Does Brightpearl support both B2B and B2C? Yes. Through best practice workflows, automated processes and useful integrations, Brightpearl can easily support the needs of both B2B and B2C businesses. To find out more about the key functionality Brightpearl offers to both business types, take a look at our detailed solutions pages for Wholesale and Online Retailers. See the benefits of the Brightpearl Payments app in action with a personalized no-obligation demo from our business experts.